Phone 501-760-6747 for directions or questions. Free Admission;  Love Offering Will Be Received. Spa Blast 2006, was the largest public gathering ever in the history of Hot Springs. With over 30,000 in attendance in the track Infield, and over 50,000 gathered outside of the Racetrack . 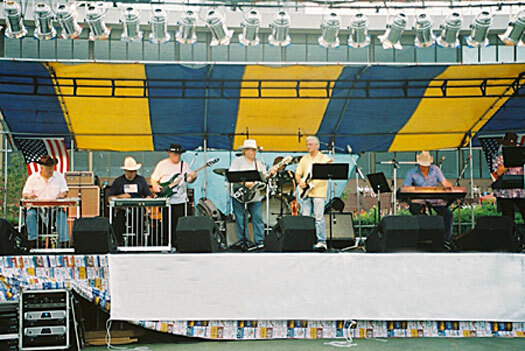 Harvey Perdue and The Fabulous Cowboy Church Band, has twin Pedal Steel Guitars, twin Lead Guitars, Keyboards, Drums, Bass Guitar, Harmonica, and Fiddle. The band members are Gene Simmons, Ronnie Neighbors, Jenny Jo Perdue, Jim Cotton, Jerry Buttrum, Charles Wood, Stan (Catfish) Lafever, and Jerry Meadors. Billed as "The Best Country Band, West of Nashville," Harvey and The Band perform over 125 shows annually. They perform every Sunday morning at 10am and 2:30pm Matinee at The Music Mountain Jamboree Theater.